How can we confirm the voltage level from the Solar panel ? 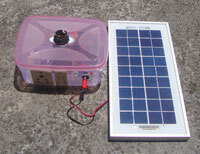 A 12 Volt Solar panel generates around 20 V DC Open circuit voltage in bright sunlight. The voltage gradually increases from 6 am and peaks in the mid noon between 11 am and 3 pm. Then the voltage from the Solar panel drops to zero around 6 p.m. So we get sufficient voltage for charging the battery for 4-5 hours only in a day. 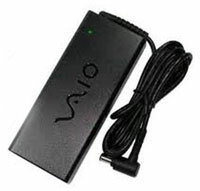 The 12 V battery requires more than 14 V for proper charging. Its current should be above 500 mA. The current rating of the Solar panel is represented in terms of Watts. As a general rule, for each watt, the current will be 80 mA. So a 10 watt Solar panel gives 800 mA current. This depends on the availability of sufficient voltage from the Solar panel. Many factors like corrosion of contacts, loose contacts in connections, dust on the panel etc will affect the current flow from the panel. 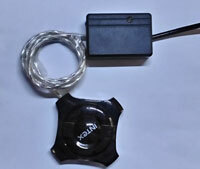 So how can we monitor the voltage level from the Solar panel. A volt meter can do but we can make a simple LED Meter for this. Its cost is less than Rs.80. It has three LEDs. 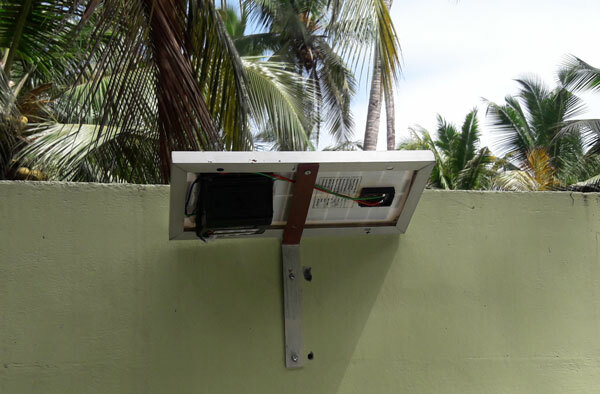 The Green LED lights, if the voltage from the Solar panel is above 13 V. Yellow LED lights if the voltage is between 9V and 11 V and Red LED lights, if the voltage is below 9V. Remember, the Solar panel is efficient only when the Green LED lights between 11 am and 3 pm.